In the late 1960's, most of the nation was in turmoil. This was true especially in the inner-cities. Community leaders in Philadelphia watched the violence in Detroit and Chicago and wanted to be sure it didn't come to their city. But how would they accomplish this? Vice-Mayor Charles W. Bowser believed the violence and protests were just symptoms of the disease and he decided to examine the disease itself. He found the problem was two-fold. First, there was not enough employment opportunity for everyone and black males in particular were being shut out of jobs at a higher rate than any other population segment. Second, one of the reasons African-American males couldn't get jobs was because local public schools were not meeting their specific needs. Mr. Bowser felt the solution was in redesigning schools so students would be ready to be productive upon graduation. 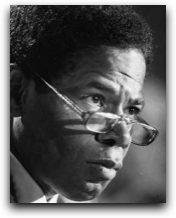 Not being an educator himself, he knew this would require a coalition of community leaders, businesses, and educators. 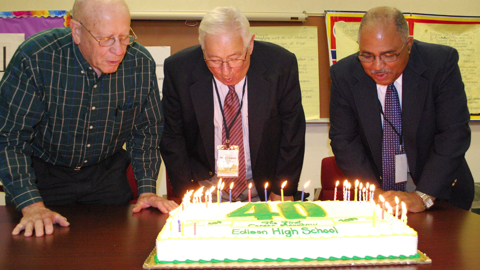 That coalition developed an idea they called "High School Academies" (later to be called "Career Academies") and opened the first one focusing on electrical engineering at Edison High School in 1969. Academies were then replicated throughout Philadelphia's high schools. Up until 1980, academies were a local phenomenon. All of that changed in 1981 when the Stanford University brought the academy model to California. Now in all fifty states and spreading to other nations through NEP’s Operation Magellan, academies are a well-researched fundamental shift in the way secondary education is delivered. For a year and a half, NEP celebrated the 40th anniversary of career academies. 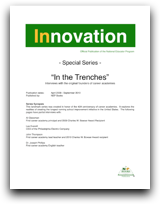 One of the most nationally acclaimed contributions to this celebration was the landmark series published in Innovation Magazine. It was written in four parts and two strands. "In the Trenches" was a look back at the first academies through interviews with the teachers, administrators, and corporate partners who made Charles Bowser's idea into a reality. 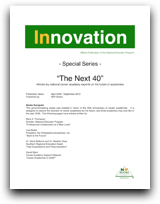 "The Next 40" was a look ahead at what career academies may look like in the year 2049. Authored by five national experts on career academies, this series provides direction and cautions for today's academy leaders as they prepare to hand off this valuable model to the next two generations of educators. In honor of the originator of career academies, NEP creates the Charles Bowser Award. 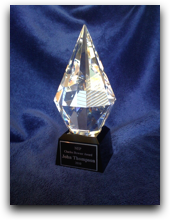 It is given to someone who has national or international impact on career academies. Learn more about the Bowser Award. 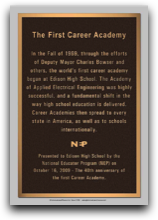 NEP donates a historical marker to Edison High School in Philadelphia, forever identifying that school to visitors as the birthplace of career academies! 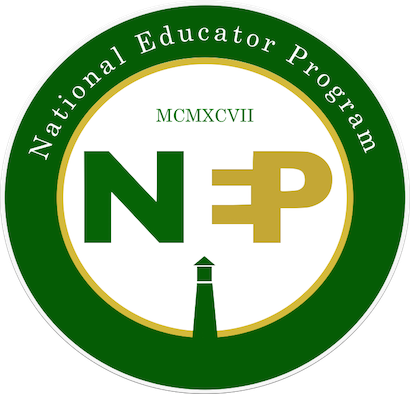 40 years of academies, their historical heritage, and their future become the centerpiece of NEP's annual conference. Participant's "traveled through time" to get the whole career academy experience. As NEP's final action during this 18-month celebration of career academies 40th anniversary, we establish the future by creating the NEP Alliance. The NEP Alliance is a multi-national body working to create and support new career academies in other countries! Learn more about the NEP Alliance. Who Joined Us for the Party? It wasn't just NEP. The 40th anniversary of career academies was an event for all agencies who support the career academy movement! Thanks for joining us . . .